I’m struggling with the EA model of “Games as service” as I play through (and largely enjoy) my time in Battlefield V. I know that sounds confusing and bear with me as I try to explain. 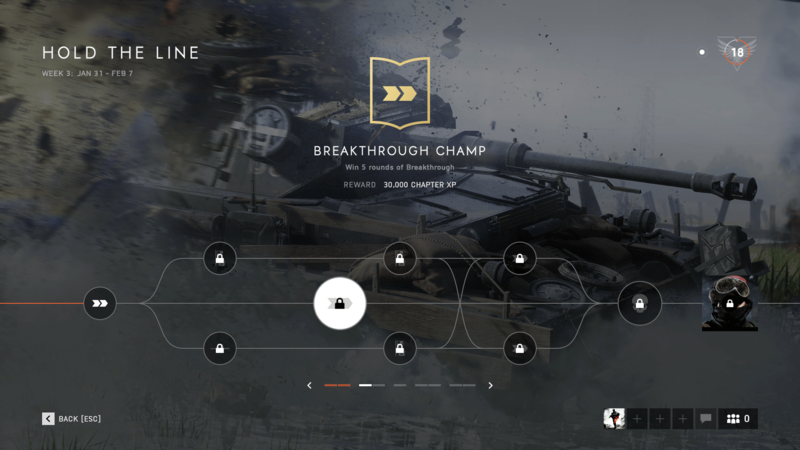 Instead of DLC packs BFV went for periodic events, that last a determined amount of time (and that reward many different things). Currently we are doing one that has two sets of rewards – one set for the weekly accomplishments, and 40 XP levels for the over-arching rewards. Each of the weeks (4, in this case) give bonus XP for the specific ‘chapter’ of the game, and the XP levels raise in difficulty to obtain. So this is the new system. The downside is obvious. If you miss a week of gameplay, you can’t unlock anything from the week. EA claims that you will be able to get these in the future in other ways without specifying that “other ways” probably means in the cosmetic pay-for store. I haven’t even hit max level in the game after 100 hours of gameplay, and the chances of me hitting level 40 for a chapter is remote. Mostly because this kind of achievement based gaming makes me play less, not more. That may not make sense to you but I now only play when I have easy to reach objectives. Last week, I unlocked everything I could in two gameplay sessions. Since there was nothing left to unlock (outside of a long, chapter level grind), I stopped playing. The new week launched and now I am playing again. I know once I finish off the rewards for the week I will be done again (until next week). Curious how these gameplay levers and buttons to push influence your gameplay? Do they at all? They are called Daily Login rewards. Cept EA calls them something else. Why are you playing a game only for these rewards, rather than playing the actual game? Seem so very meta. Sounds like my experience with Destiny 2. I got to where after the weekly reset happened, I’d jump in and do the goals I could complete solo, which would take 1, maybe 2 play sessions, then I’d play something else until the next week. Until I realized that Destiny 2 had become a 2nd job and I quit altogether. I wasn’t playing on reset day because it was fun (it was generally grinding Public Events over and over), I was doing it to get the weekly rewards most efficiently. I’m still having fun, but oddly enough the gameplay itself isn’t the reward anymore. Just the challenges. It’s odd to still have fun but feel like there’s not much to do without it.